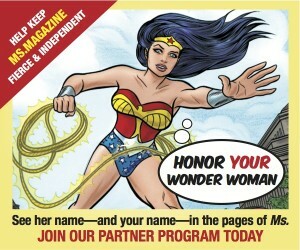 This March, for Women’s History Month, the Ms. Blog is profiling Wonder Women who have made history—and those who are making history right now. Join us each day as we bring you the stories of iconic and soon-to-be-famous feminist change-makers. My mother was part of Women Strike For Peace in the early 1960s and, along with thousands of other women across the U.S., she helped put an end to above-ground nuclear bomb testing. Women Strike For Peace organized in response to the St. Louis Baby Tooth Study, which revealed that Strontium-90 released from nuclear bomb tests in Nevada had contaminated cow and human breast milk and poisoned children’s bodies across the country. Horrified mothers rose up in protest and their efforts led, in large part, to the Partial Nuclear Test Ban Treaty in 1963. In later years, my mother and father participated in the Nuclear Freeze movement to ban nuclear weapons and shut down nuclear power plants in the U.S. So, when three Fukushima nuclear power plant meltdowns occurred after March 11, 2011, my eyes and ears were peeled to any and all news I could find about the accident. On March 28, 1979, Unit 2 at the Three Mile Island nuclear power plant, located near Middletown, Pennsylvania, had a partial meltdown. Mitsuru Katagiri, the translator of Smith’s Minamata book—a university professor and anti-nuclear activist—went to the site with a scientist and lawyer to investigate. When Mitsuru’s team returned to Japan, they reported that the situation on the ground was quite different than official statements which claimed no harm had been done. Mitsuru’s team, Smith says, heard and saw a different story: the locals near the nuclear plant noticed strange tastes and smells. Then, later on, their animals became sick and many people had strange ailments. Smith then traveled to Pennsylvania with Katagiri where she spent several months interviewing 250 citizens affected by the accident. The interviewees in Pennsylvania repeatedly asked the research team about nuclear power in Japan: “Well, there must be no plants in Japan because you have earthquakes?” These inquiries stirred Smith, because Japan did, indeed, have nuclear power plants and the country is very earthquake-prone. When Smith returned to Japan, she turned her full attention to the anti-nuclear cause. In 1988, Smith helped collect 4 million signatures calling for a ban on nuclear power. In 2004, she made the public aware of the government’s attempt to pass on the cost of reprocessing MOX fuel (plutonium-uranium mixed oxide) through citizen tax dollars at a cost of 8 trillion yen (about $66 billion). For years, Smith’s team worked diligently to achieve the now-de-facto moratorium on highly dangerous MOX fuel in commercial nuclear plants in Japan. In 2010, she helped lead a large movement warning of the dangers of nuclear power—especially in high-risk earthquake areas such as Fukushima. After the 2011 Fukushima disaster, Smith protested the restart of nuclear plants in Japan and participated in countless anti-nuclear rallies, legal battles, and presentations before politicians and corporate boards. In one large anti-nuclear Occupy event in 2012 (pictured above), Smith’s team and many others camped out for over 10 months in front of the Ministry of Economy, Trade, and Industry (METI). At the end of the Occupy period, the women danced in celebration. Smith is pictured with them in the center. Most people in Japan do not question this gender inequity, as the dominance of men over women in Japanese culture is so embedded. Smith believes that to avoid accidents, the gender inequality needs to change. Currently, anti-nuclear activists and those watching out for safety issues in Japan are mostly women and many mothers from Fukushima. Yet they have little political power. Women activists have to go up against male politicians and male members of the nuclear industry. Overwhelmingly, women’s arguments are silenced, Smith says. But they fight on. Aileen Mioko Smith comes from a long line of anti-nuclear mothers and feminist activists. 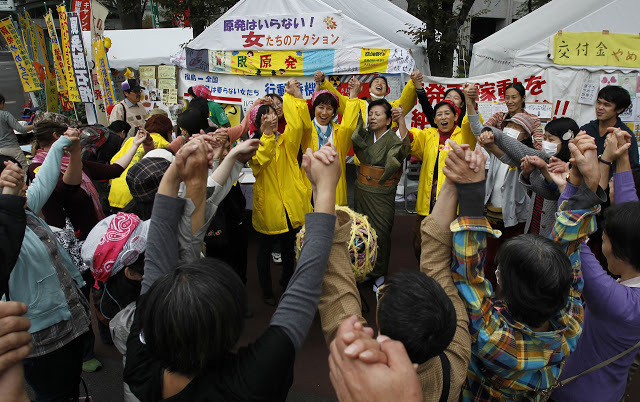 Women’s History Month falls in March, the month of the Fukushima disaster in 2011. We honor Smith’s and other women activists’ ongoing efforts to protect the lives of the people in Japan, especially the children, on whose behalf she works tirelessly to safeguard their health and future.